Bad drawing stance or not, Dorkin’s perseverance paid off. In a career lasting the better part of three decades, Dorkin has become world famous for his raw humor and anarchist comics, including Milk & Cheese (a wildly popular, manic title following the adventures of the anthropomorphic “dairy products gone bad”), The Eltingville Club (which pokes fun at fan culture) and Dork (a loosely autobiographical collection of strips and short stories). But his tendency to bend and hunch while drawing also led to lifelong problems with repetitive strain injury (RSI) and back pain. That’s why, when young artists ask him for career advice, the 52-year-old winner of multiple Eisner and Harvey award is more likely to talk about ergonomics and wrist braces than getting the attention of Marvel or DC. 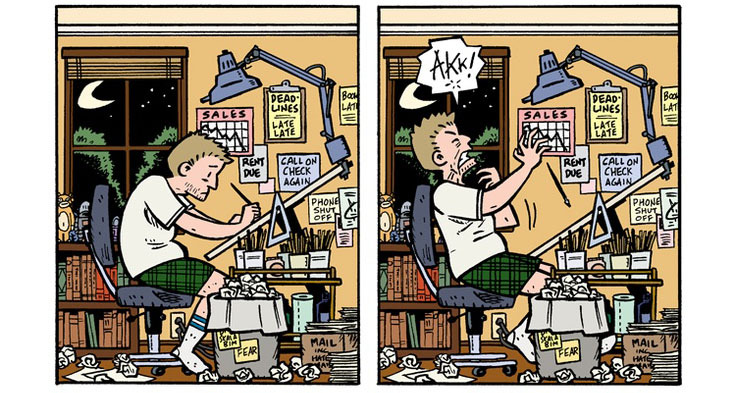 Evan Dorkin at his home studio. Dorkin has had a big impact on the comics field. He is the co-creator of the award-winning horror series Beasts of Burden, where a team of stray dogs investigate paranormal activity. He and his wife, Sarah Dyer, have written for various animated series, including Superman, Batman Beyond, Space Ghost Coast to Coast, Ben 10, DC Nation, and Yo Gabba Gabba. Evan’s work has appeared in MAD Magazine, Spin, Esquire, and The Onion. But most of that achievement has happened in the face of chronic pain. 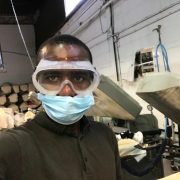 The pain started in his 20s, due in part to a few mishaps, ranging the gamut from a car accident at 19, to an injury from playing tackle football with no equipment with his coworkers at a Staten Island McDonald’s, to his own mother’s well-meaning but ultimately terrible advice to start cracking his own neck. 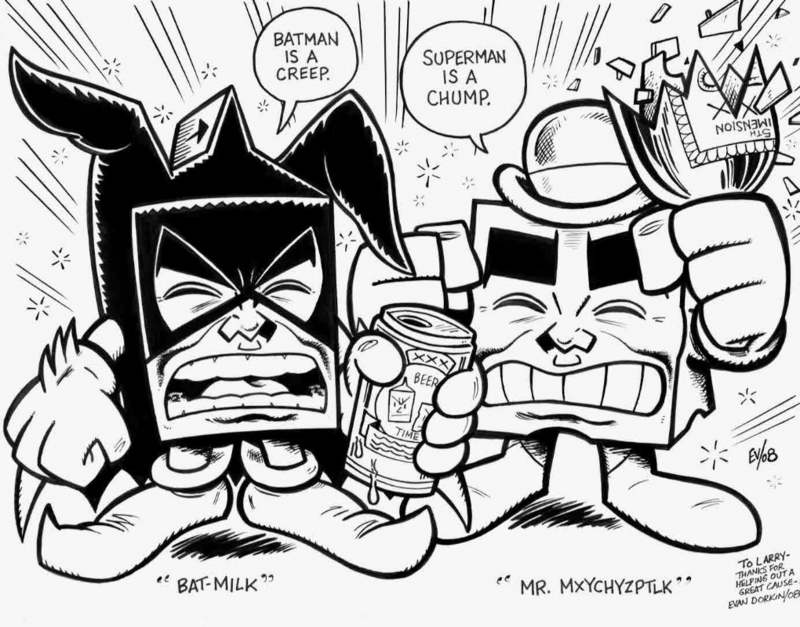 Milk and Cheese are probably Dorkin’s most famous comic creations. Still, Evan attributes a lot of his issues to the repetitive motion required in his work, since his neck, shoulder, and finger pain is exacerbated by drawing and typing. “My hand sometimes just feels like raw meat while I’m working and I can’t do as much drawing as I’m used to,” he says. These days, Dorkin recognizes that while drawing and writing are his passions, he has to do them in moderation. Consequently, he balances his work with spending time with his wife and daughter and their cat. Together, they live an idyllic life that seems a little out of place for the creator of two mass-murdering Dairy Council mascots: a typical day might see him reading a book, taking a long walk with his daughter, or feeding birds and squirrels in his backyard. 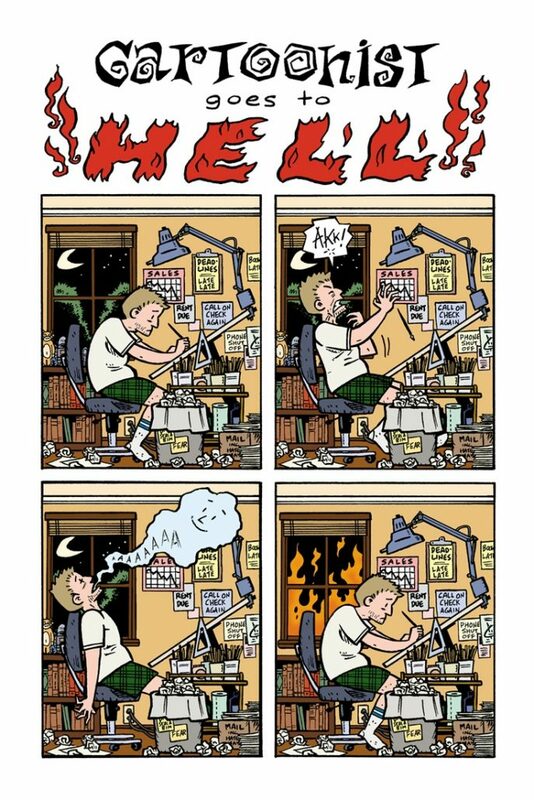 This comic represents a typical day in a cartoonist’s life, according to Dorkin… including the inevitable bout of pain. But when he was younger, Dorkin advanced his career at the expense of his body. He’d draw for 18-hours straight, leaving the table only to go to the bathroom. Sometimes he and his wife find themselves working 14 hour days for weeks straight. At one point, he recalls, his hand was so messed up that he had to pick it up by his thumb and place it where he wanted to draw. “It’s tough, because we want to make comics, but we never thought about how we have to stay healthy,” he says. Nowadays, Dorkin is able to turn down work so he can draw at his own pace rather than taking every job that comes his way. He’s got health insurance. He does exercises for his mind and back, and practices mindfulness. “If I had to draw the way that I used to, I don’t know what I would do,” he says. According to Dorkin, his case is–sadly–all too common in the comics trade. In fact, it’s a silent epidemic. Many of the other artists he talks to have arm and hand issues, and because of the freelance nature of the comic industry, they are often uninsured or badly insured, so they can’t get treatment. He jokes that you can tell the most successful cartoonists from the lavishness of their wrist brace. 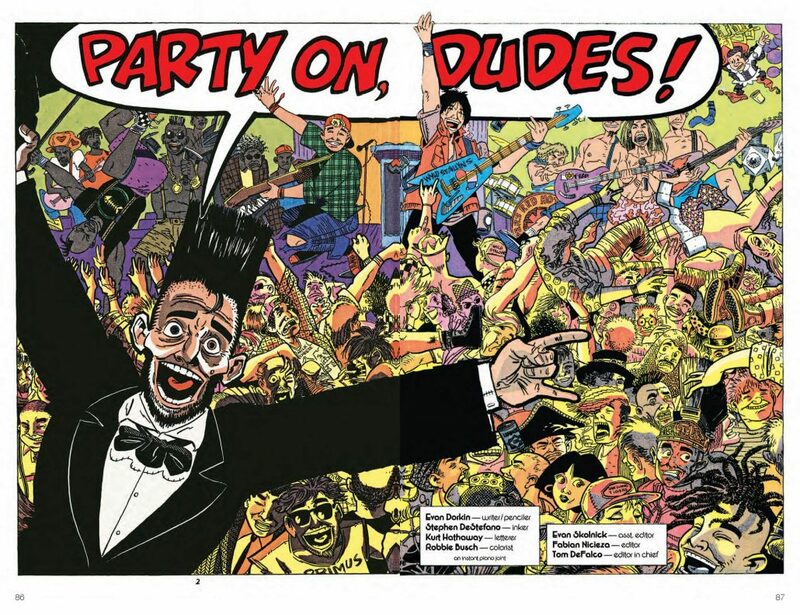 Being a comic artist isn’t a party, says Dorkin, unlike this panel from his Bill & Ted comic. So what’s a young comic artist with chronic pain issues to do if insurance is hard to come by and time off non-existent? 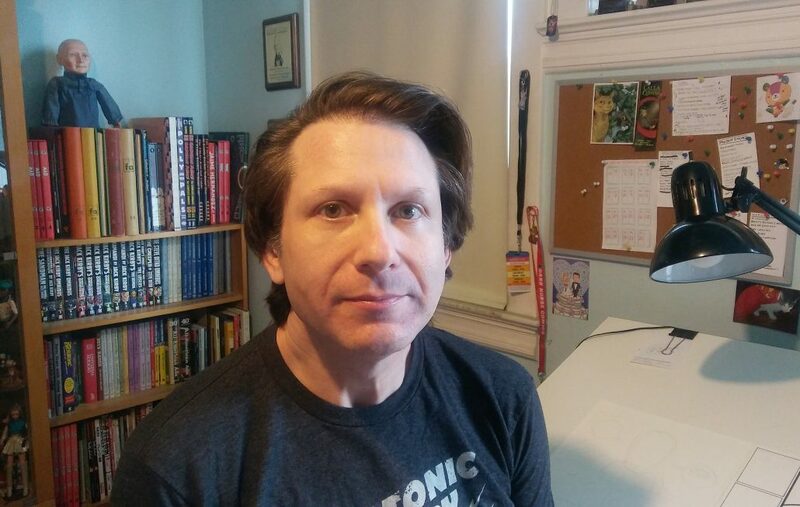 Dorkin’s a realist, so he recommends that young comic artists or cartoonists vary their portfolio so they can switch it up between writing, drawing, inking, and other work when one kind, in particular, is causing them too much strain. Young artists need to prevent injuries and strain before it starts by paying attention to posture, technique, and ergonomics. And moving away from big cities like New York, Los Angeles, or San Francisco can help keep living expenses low, which helps save up a nest egg when an artist absolutely needs to take time off.